We have just released a pretty important HSMAdvisor v1.217 update! I strongly encourage everybody to go ahead and install it as it contains some big improvements. A Warning now shows up when HSMAdvisor is closed with DB changes not saved. A local backup copy of Shared database is now created on each computer for cases when connection is unavailable. Fixed some (./,) locale-related problems. Fixed the problem of some settings not being saved. 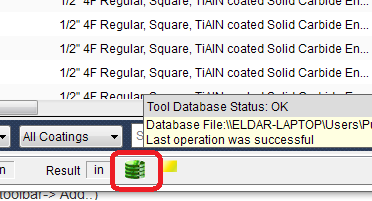 On the status bar of HSMAdvisor screen you can now see The Tool Data Base Status indicator (later DB Status) icon. 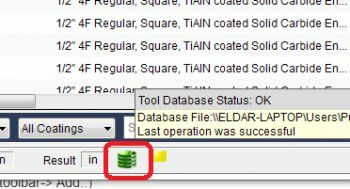 It can right now show the 3 different states the Tool DB can be in. You will not be able to close HSMAdvisor while writing process is going on. If you try to shut down HSMAdvisor at this point you will be warned about loosing your changes and prompted to save your current Tool DB if you choose to go forward with closing it.